C. Jane Kendrick: A Carnival For Nie! 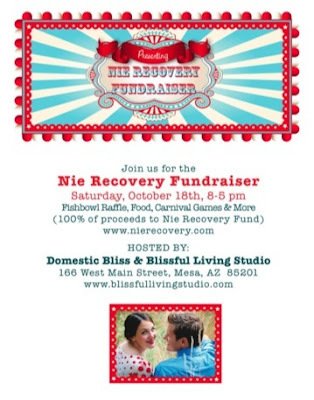 On October 18th, Domestic Bliss of Mesa Arizona, will be hosting a Nie Recovery Carnival Style Fundraiser as part of their Fall Blissfest. Part of the festivities will include a silent auction. The online bidding is now available at We Love The Nielsons. Also, as an added incentive to start the bidding, you will find a touching video about Nie on the this website . . . seriously, go there and enjoy. Like, let it be your next click.